Reveals the magic of natures nighttime creatures. A lot happens in the natural world while you sleep! Nocturnal Animals is your guide to discovering what in nature you nightly miss. The included UV light reveals the night time creatures. Moonlight reflecting off the surface of a pond. Fireflies twinkling in the bushes. Owls gliding through the air. A Bengal tiger lounging on a low-hanging branch. Welcome to the world of Nocturnal Animals. 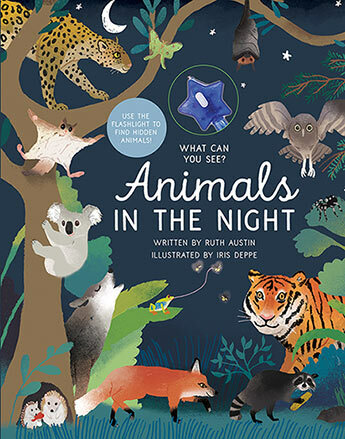 In this exciting new animal book for kids, you will explore the lives of these nocturnal creatures in stunning, fully illustrated detail. Journey to distant lands in search of amazing animals like the Samoan fruit bat and the cuddly koala. On the way, you will learn about the African leopard, the rare luna moth, the sly red fox, and many other creatures. This innovative 32-page book includes speciality printing that makes it come to life under the included UV light! Just shine the light to reveal the nocturnal animals hidden in the spreads. Ruth Austin has over 10 years of experience making books for children. She got her start in the UK working on the highly acclaimed picture book list at Macmillan Children's Books before deciding on a whim to exchange rainy London skies for rainy Seattle skies. She's ghost-written activity books for bestselling authors and edited non-fiction children's books with print runs in the hundreds of thousands. She writes gift books for grown-ups, too, and the odd stationery product, but children's books remain her first love. Her Kirkus-reviewed picture book, So Many Cuddles, was published in June this year. She spends her days having fun with words (hers, yours, anyone's) and loves nothing more than other people's crazy new ideas. Iris Deppe was born and raised in the Caribbean and lived in the Netherlands for several years while she studied Illustration at HKU University of the Arts. Currently, she resides in Copenhagen, Denmark. Iris enjoys working on many different projects, from drawings, collages, and album covers to children's book illustrations and films. She finds inspiration in absurd situations, nature, and 60s & 70s music, and she has a big love for primary colours and the sea.